Upper Deck products this year have been few and far between. Collectors have been starved to open up some new hockey product from UD and now finally they can. The venerable SP Game Used cards have arrived on hobby store shelves and in online inventories. Is this product worth the relatively high price point? Let's crack it open and see! The SP Game Used base cards this year employ simple geometric lines and rectangles to shape the look of the card. The card is bordered by a dark grey rectangular portion at the top, as well as rectangular foil lines on the left side of the card. 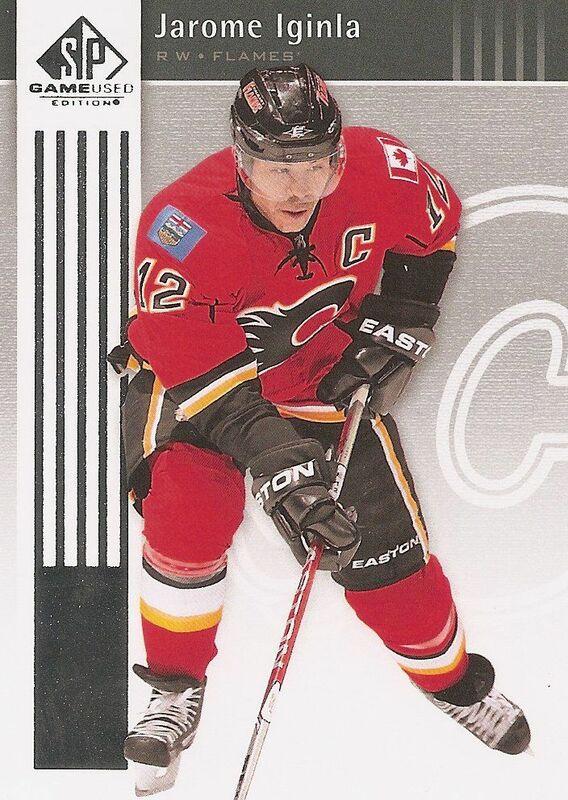 A full-color photo of the player pops up on the front of the card amidst a silver background adorned with the team logo. The design uses touches of foil to highlight certain aspects of the card. Though I usually am a huge fan of Upper Deck base card designs, I do not find this one particularly appealing. To me these base cards fall into a 'no-man's land' type territory. They are not busy enough to be exciting or dynamic... and they are not sparse enough to have that great simple elegance that UD usually shows in SP Authentic designs. All in all I found the base cards to be a disappointment. Given then you only get one per pack, I don't see collectors clamoring for these cards or trying to complete a set of these - which is a shame for such a highly priced product. The back of the card mirrors the front of the card in many ways. 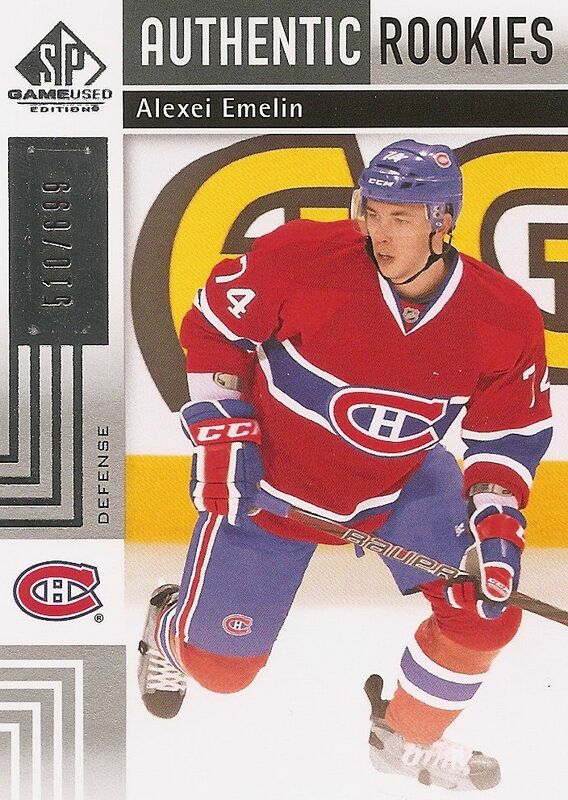 The geometric lines are revisited sans foil, and the player photo is back sans color. A short blurb of information is given about the player as well as up to 5 years of statistics. Just as with the base card fronts, I find the backs functional but un-special. Well, at least they're consistent! The rookie cards that make up the tail end of the main set have a related, but slightly different look than the standard base cards. Rookie cards in SPGU are a part of the Authentic Rookies subset as shown at the top of the card. Also, instead of having the plain sliver background with team logo, the rookies have action photos. The rookie cards come in two limited variations. The top rookies from this year's class are numbered to just 99 copies - all others are numbered to 699. SPGU is not a product known for its rookie cards. And this year's design doesn't help. These cards are busier than their base card brethren, but I'm not sure if it's in a good way. Because the main rookies are limited to only 99 they will carry some good value, but I don't see these cards making the must-have lists of the majority of collectors. Each box of SPGU should come with at least one autographed card numbered to 100 or less as well as a game-used card numbered to 100 or less. Each pack of SPGU will have a 'hit', though most of the time the 'hit' will be a plain jersey swatch. 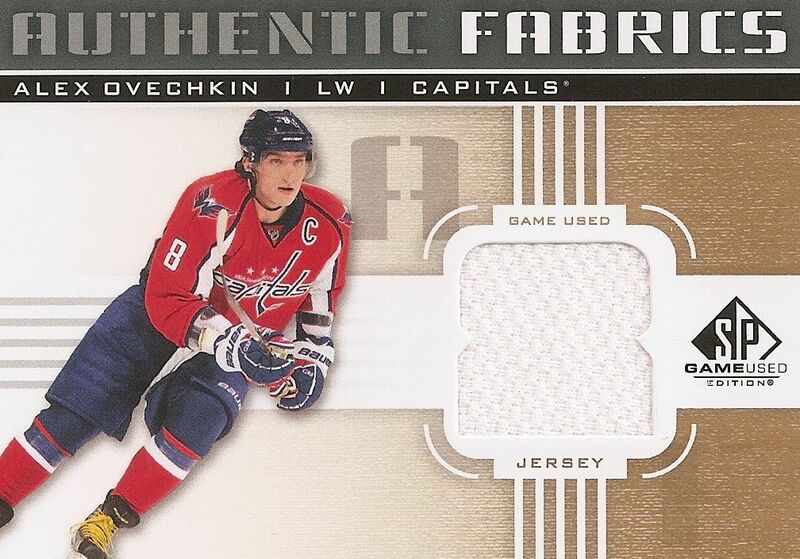 The Authentic Fabrics jersey card is what you will typically find the most of in a box of SPGU. These cards feature a swatch of game-worn material on the front. The windows of these cards are shaped to a letter, number, or symbol. Collectors can collect all the different variations of these cards to spell out a variety of things. For example, for Alex Ovechkin you could collect all four cards to get: G-R-8-8 (Great eight). This is a sneaky (but fun) way that Upper Deck has gotten a little more out of these cards. In previous years the Authentic Fabrics only came in the square variety. This year collectors can chase the different variations and come up with fun ways to collect. I'm already thinking of putting combinations of colors together to make a set of the same player look unique. In the end though, these jersey cards have pretty much played themselves out. Besides the unique variations this year, it isn't too much different than in the past... and these cards are getting a bit old and tired. The Authentic Fabrics come in both numbered to 100 variety as well as the standard unnumbered kind. Collectors can also find autographed manufactured patch cards within SPGU. I find this extremely strange for a product called 'SP GAME USED'. Shouldn't everything from this product be from something used in an actual game? In the two boxes that I purchased, I did manage to get two manufactured letter cards. I guess Upper Deck really wants to help people with spelling because here, like in the Authentic Fabrics before, collectors get the chance to collect and spell out different things using these cards. In the video above, the last hit I got was an Evander Kane autographed manufactured 'C' card. I am assuming since he is in his Canadian uniform that the letter 'C' is part of the word C-A-N-A-D-A. These cards are great when they are all put together, but doing so is not an easy task. The cards are difficult to find and typically pretty expensive for what they are as well. My other manufactured letter card was of Jordan Eberle. I chose not to show it because it was a redemption card - a bit disappointing since this product was delayed so heavily. My greatest pull from my boxes was this Roberto Luongo By the Letter card. This is a spectacular piece. And this is the type of card you hope to get when buying SPGU. The card is the actual letter from the back of a game-used Roberto Luongo jersey. This card is numbered 3/6.. the first 'O' in Luongo. Upper Deck did a very nice job with this card. It is very clear that this is not a manufactured card and the photo of Luongo is a nice size - sometimes with large pieces of memorabilia the photo of the player can be too small... but not here. Kudos to Upper Deck for doing their really high-powered cards the right way. Cards like the Luongo come few and far between... but there are some pretty spectacular cards to find in SPGU this year if you're lucky. Look out especially for the new Supreme Pad cards. These feature giant pieces of the goalie pad. I've seen some hit eBay already, and they are great cards. Check them out for yourself! I consider myself very lucky for having pulled the Roberto Luongo By the Letter and Jordan Eberle autograph. I would have to say that this is not typically what you find in SPGU. Boxes of SPGU are about $180 right now. For that $180 you get six packs with most of those packs containing plain jersey cards usually tossed around in a $1-$5 bin. I witnessed a break where one box only had six jersey cards - nothing else. I was shocked. Obviously Upper Deck made a mistake with that box and should do something about it... but many of these SPGU boxes will disappoint in a major way. I remember striking out majorly with SPGU last year and I expected the same results this year. Like I said, I did pretty well, but it's not a risk I'd recommend others to take. The best way to get your hands on SPGU is to let the high rollers bust open all of the product and get what you need from eBay or from trading. This years SP Game Used has taken a spin. They have lowered the price down by around $30 USD from last years product. I highly recommend this product to anyone who has the money to spend on the product. Thanks again for the review Luke! If you are interested in moving the Eberle card let me know! I would be willing to trade or buy it from you. I received my first two boxes of 11/12 Panini Limited yesterday and when I went back onto Dave & Adam's website last night and saw 11/12 UD Game Used had just been released, I'd much rather order another two boxes of Limited. I really don't like the design of Game Used's cards and I don't think the hits are there to justify such a high asking price. I wonder if the lack of UD products has anything to do with all the lawsuits they are facing at the moment. Either way with Panini's upcoming lineup and ITG's Between the Pipes still to be released UD is facing some stiff competition, and they'll need to do better than this. Yeah you'd have to be lucky for this one to be worth it. If you're going to get almost only plain jersey cards, might as well just buy it by the pack and not spend nearly $200. The Luongo is sick though. Not a good product. Crown Royale / Limited has better value at almost half the price point. Only chance I will touch this product is if it's in the form of a mix of boxes in a group break. The By The letter cards are great - because collectors can collect the entire nameplate of their favourites! I was hoping for more patches. The first few, that I have seen, were loaded with standard jerseys. I agree with you that there are some big pulls to be found, but they will be a lot harder to find. wow! thanks for reading my review chris! that is SOOOOO COOL! I have always been a big fan of SPGU. I usually buy a case may more of this stuff per year. But this year i'm not the biggest fan. I will not be buying a case maybe a few boxes. Once again thanks for the contest luke. Im not a big fan of SP Game used becuase its pretty pricey for such a big hit or miss product. The thing Ilike though is that when you hit, you hit REAL BIG, but for the most part good boxes are hard to come by from what I seen. However I will be busting a pack or two to try my luck! Tottally agree with you on the base cards. I just think the design is simply boring. Maybe if they added some color to it it would be a little more appealing. One thing I do like is how the jersey cards will spell out something. This will leave challenging, but fun collecting. But for the price of 180 bucks, I think I can buy something better than this. Not a fan of the look of the product, I actually think it's rather ugly, but the chance for a big hit is nice, as you hit. Definitely not a 200 dollar product. SP Game Used is arguably the most overrated product. Yes you can hit big stuff, and BIG stuff at that, but it's extremely hard to do so. Not to mention, people talk about how Panini, or Artifacts, are parallel hell for their PCs, but what about this? Some people have not only base parallels, but the jersey parallels, and MORE new parallels, as well as the multiple ones like the Quads, Fives, etc. (For the record, not counting 1/1's, I still have 15 to chase..) And with the insanely high price to crack it, the odds of getting all of them down are ridiculous. Upper Deck needs to either rethink this product inside and out, or start lowering the price. Because this is FAR from the price tag it comes with. Not worth the money, VERY hit and miss in my opinion and should be half the money! I actually thought this set is sick! I'm always a fan of the full player shots in the base sets and vertical picture. i like the short printed gold cards and the patches seem to be very nice from what I've seen busted on youtube... only knock is the price for 6 packs of cards haha! awesome review though! may have to collect this set! i think this is a little overpriced but i really like the players in the cheacklist i do like the patches and the auto. This product seems to be a little overpriced. For the box breaks I have seen your Loungo takes the cake but I guess thats why it's more of a gamble. SP Game Used is horrible. You barely get any value, most boxes are bad, and its wayyyyy overpriced. 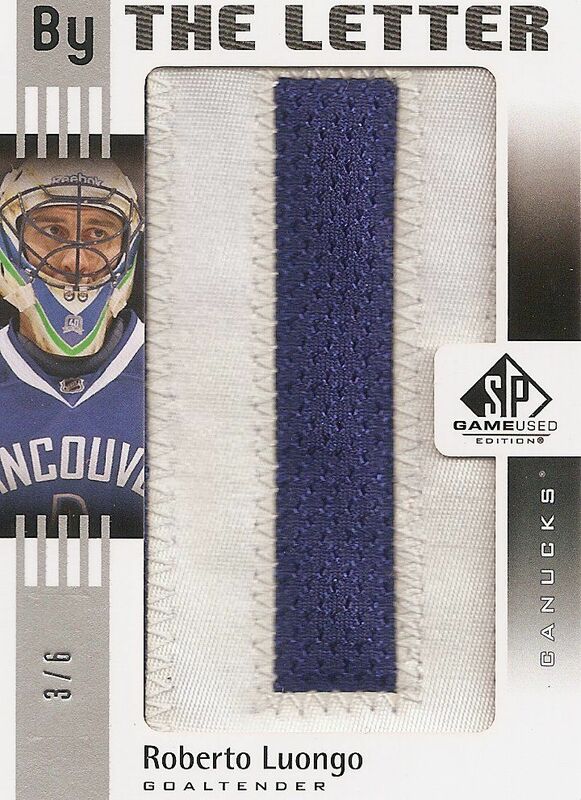 I would give it a 7.3/10, since there are a couple nice pulls to be found, like the sick Luongo. SP Game Used is nice. I liked your Luongo By The Letter. SPGU is a joke this year. They wait until the playoffs start to release it and his the rookie checklist of something that was released around the time of Artifacts. Anyone who pays $180 for a box of this should just check into Gambler's Anonymous. Panini is pwning UD right now. SP game used I think, is just a very bad product. I was looking forward to this product (because of last years game used)but now that I see how not lucky the average youtuber is, I pretty much think of this product as a rip. The base cards look pretty darn bad and the jerseys look pretty bad to. The patch cards are not to bad and the rookies, I'm not going to mention that one. Overall your rating out of 10 is pretty good. sp gameused is too pricy and u dont get alot for what u pay for. I think the design looks like it is from several years ago but i love the by the number cards they are awesome! Sp game used is preety cool this year. Hope I win. Thanks for the contest sheep. I don't really like the design of this years SPGU. It's either hit or miss forsure. So i'll stay away. This years SP Game Used is either go big or go home, real hit or miss. I honestly will be staying away from this product, I've seen quite a few brutal breaks. The resale value is horrible unless it's something huge. The designs are solid but it's a huge risk. spgu is sick this year. they really changed up the designs for the base and the jerseys. SPGU is always a product that is a hit or miss. For one pack it cost 35 bucks and all you get in general is a basic jersey. That isnt so great. Other than that i love spgu! Just a quick question about the "By the Letter Card". 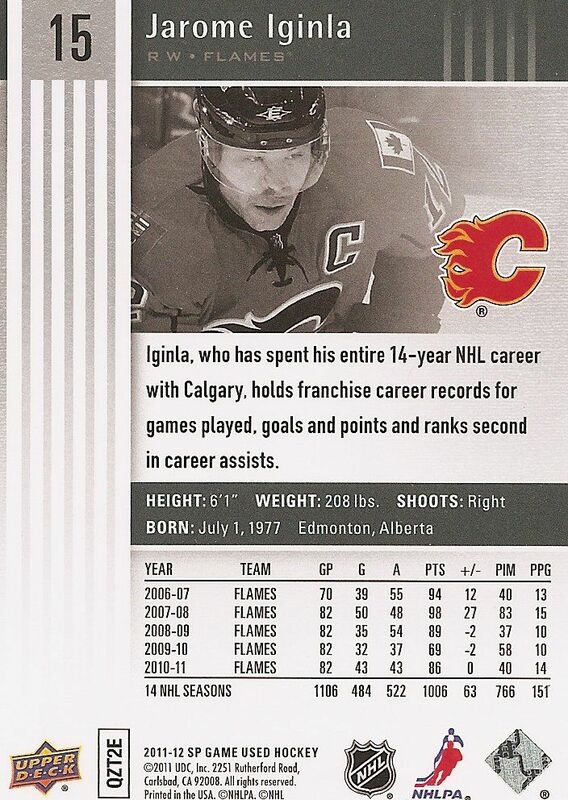 I recently pulled an Iginla card with an I, are there only 6 cards that make up the name, as in Luongo/Iginla? Yes, you're exactly right... a By the Letter card is numbered to the player's last name. I saw a Taylor Hall on ebay for a ridiculous amount of money... of course that one is limited to just 4. Your Iginla is a really sweet pull though, great player! This years SPGU was to expensive since they have added 4 unnumbered jersey cards that would BV 3-7 dollars. To much money. but the kane Team marks auto was nasty!! personally i havent opened an spgu box but i have seen some guys pull some pretty sick cards. i also like the design of the cards this year.